Hakodate wasn’t in our plans for this tour of Tohoku. But as it happened, the weather in Aomori was totally drab and we didn’t want to waste a day brooding. So armed with our JR Passes and in a spur of the moment thing, we just caught the train to Hakodate. We did tour the incredible island of Hokkaido a couple of years back in 2016. It was a memorable trip whence we covered the beautiful snow covered areas of Sapporo, Otaru, Obihiro, Kushiro, Abashiri, Asahiyama and even Wakkanai. 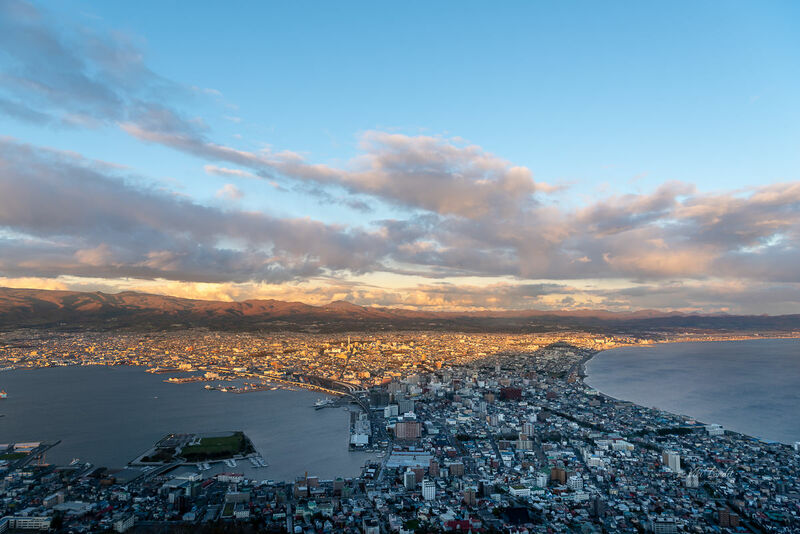 But we missed out on Hakodate because of lack of time. 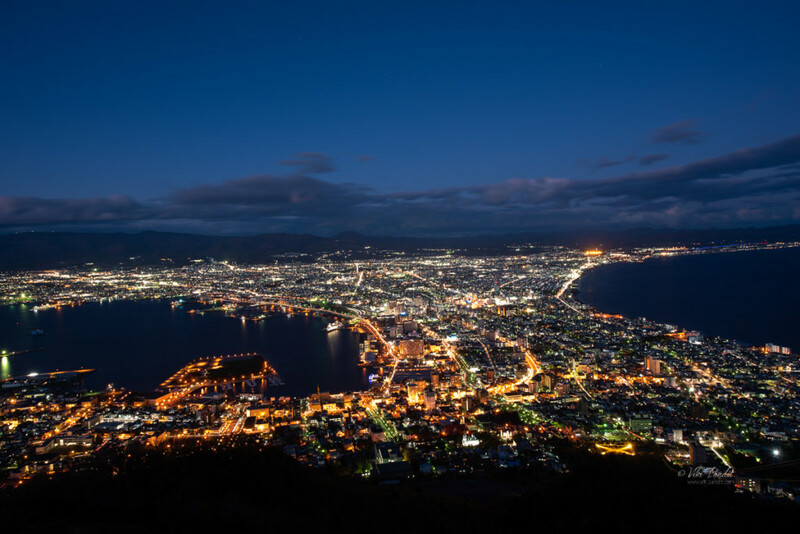 Now, the night view of Hakodate is a very popular sightseeing destination in Japan. Awarded with three stars in the Michelin Guide, the night view is also called – The million dollar view. 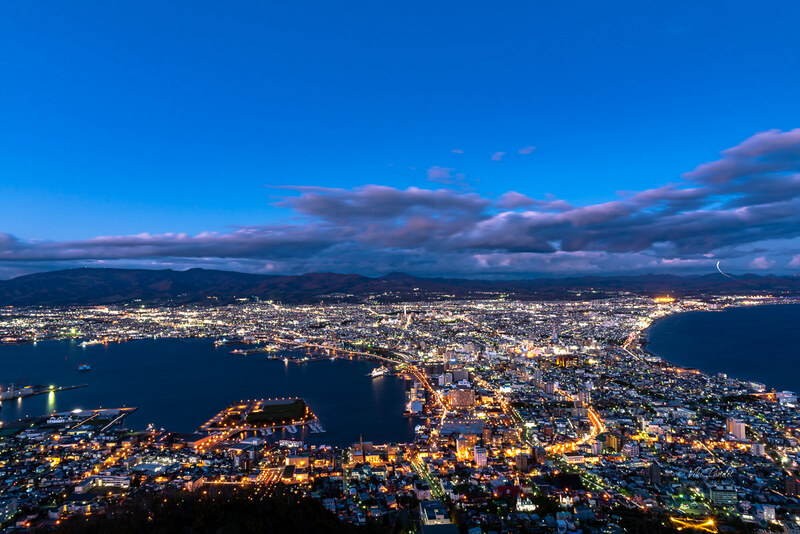 At an elevation of 334m, with the Tsugaru Channel on the left and Hakodate Bay on the right, it sparkles like jewels in the night. So even though it was almost a 2 hour ride from Aomori, we decided to go ahead with the idea. After saying our prayers at the Showa Buddha in the morning, we set off for Hakodate. We reached Shin Hakodate Hokuto station by 2 pm on the Shinkansen. From there we caught the local to Hakodate Station on the JR line. All the rides on the route were covered by JR Pass. The Mt. 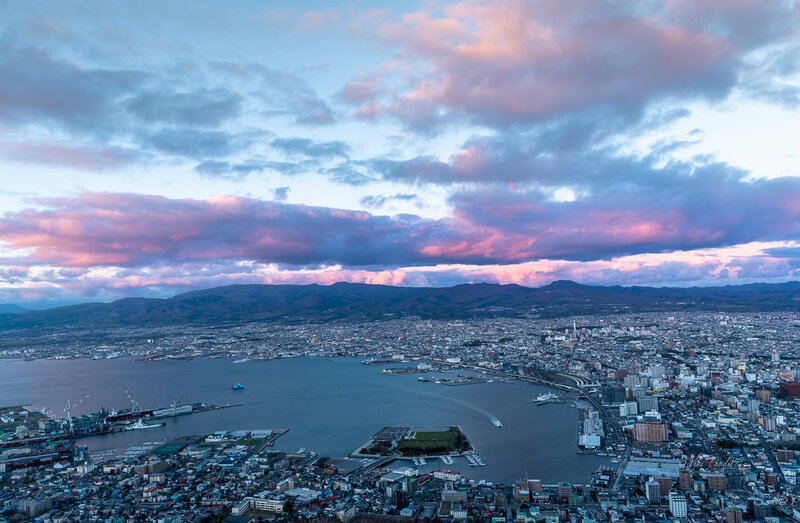 Hakodate ropeway is the preferred way up the mountain viewpoint. It connects Sonroku (mountain base) with the Sancho Tembodai (Summit Observation Deck). The large gondola can carry about 125 people at a time and just takes about 3 minutes to reach the summit. Unfortunately the rope-way was under annual maintenance, so we had to take the bus to the summit. Note that this repair is undertaken every year. So if the riding gondola is an important part of your journey, please look up the official website for the dates they will be closed. The bus to the summit was scheduled after an hour so we decided to go around the city for a bit. The tram stop was nearby and we hopped on it for a few stops. With a well established network, the tram is the easiest way to explore the city. Trams run at very frequent intervals and wait time is negligible at around 6-12 minutes. 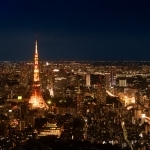 At the time of writing this article, the fares cost between 210 to 250 yen, which is paid into an automated machine while alighting from the tram. You can also purchase a one day pass. If you do, make sure the pass includes both bus and tram. I made the mistake of buying the “bus only” pass and had to pay for the ride separately. 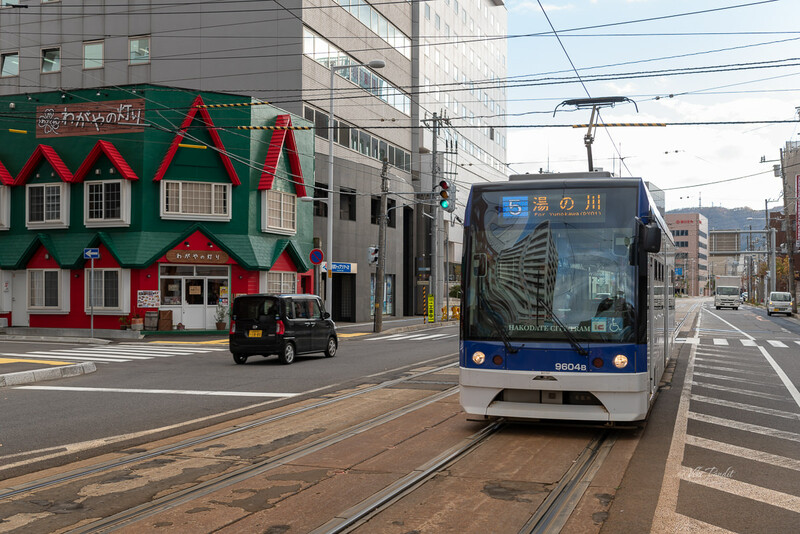 Fact-file: The first tram lines in Hakodate were established way back in 1897 by the Kikan Horsecar Railway. On alighting from the tram at the Matsukazecho stop, we found ourselves near a small Inari shrine. I later found out it was the Daimori Inari Jinja. 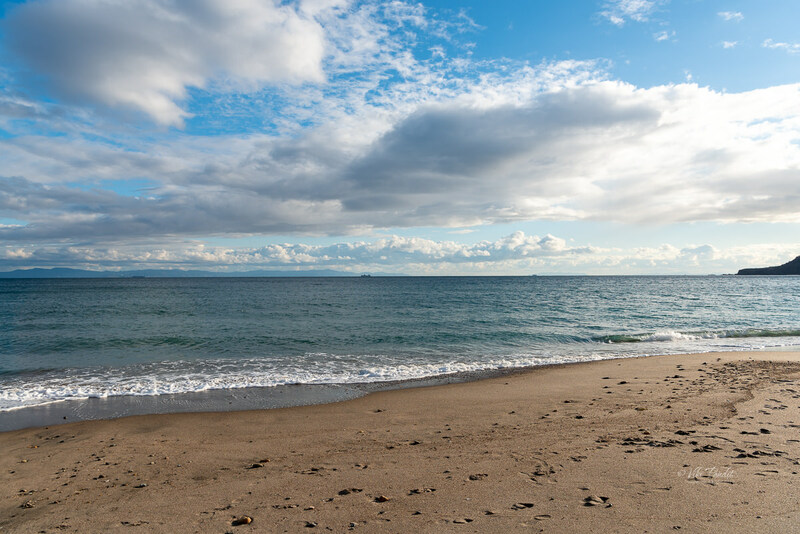 It is a small shrine along the beach. 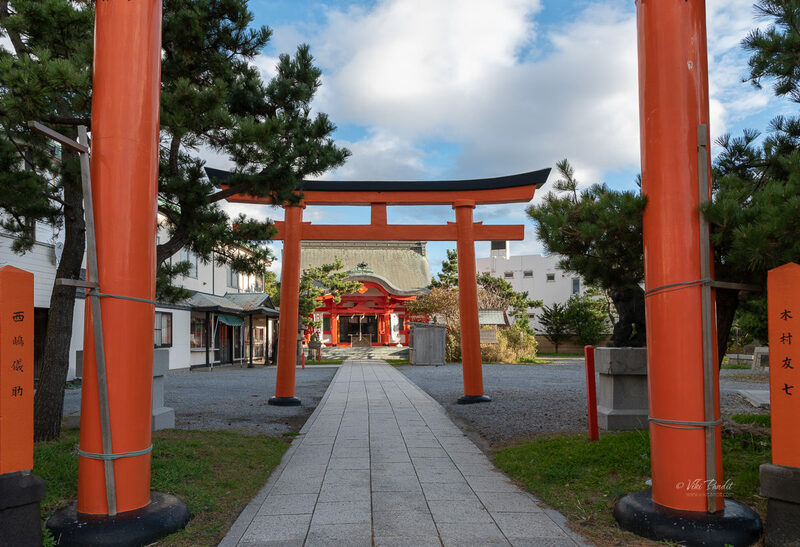 Inari is a popular deity in Japan with shrines located throughout island country. I don’t have much information on the shrine itself, but Inari shrines are dedicated to Inari, the god of rice. They are believed to protect crops and bring about general prosperity, similar to Ganesha among the Hindus. The kitsune is the messenger for Inari. 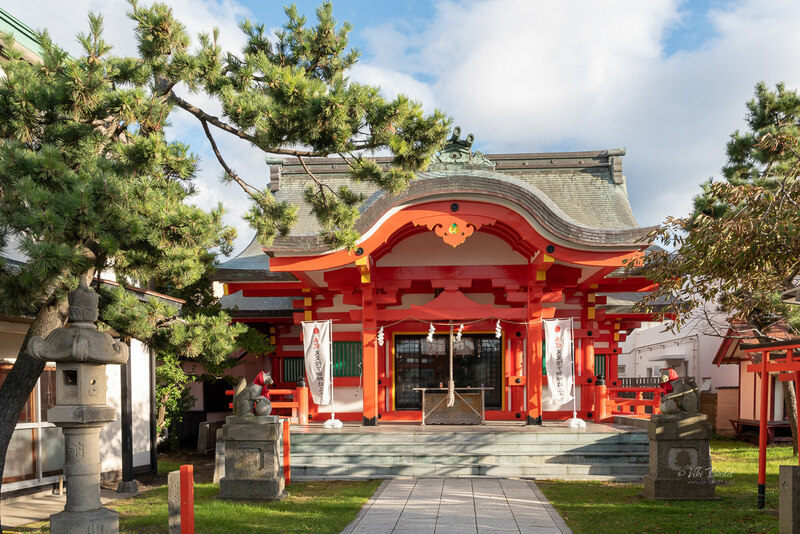 The entrance to an Inari shrine is usually marked by one or more vermilion torii (gates) and statues of kitsune (fox), which are often adorned with red bibs or scarves donated by worshipers out of respect. Offerings of rice, sake, and other food are offered at the shrine to appease and please these kitsune messengers, who are then expected to plead with Inari on the worshiper’s behalf. Isn’t that an interesting concept? We spent some time admiring the temple after which we walked up to the beach. At the beach, I picked up some soft rounded white colored pebbles as souvenirs. They also serve as a nice flooring while creating tiny rock-garden scenes for my photo-shoots. We then walk all the way back to the Hakodate summit bus stop near the JR Hakodate Station building. There was a short queue of tourists already in line for the bus. It took the bus about 25 minutes to reach the top. It is a wonderful feeling once you alight from the bus at the summit. 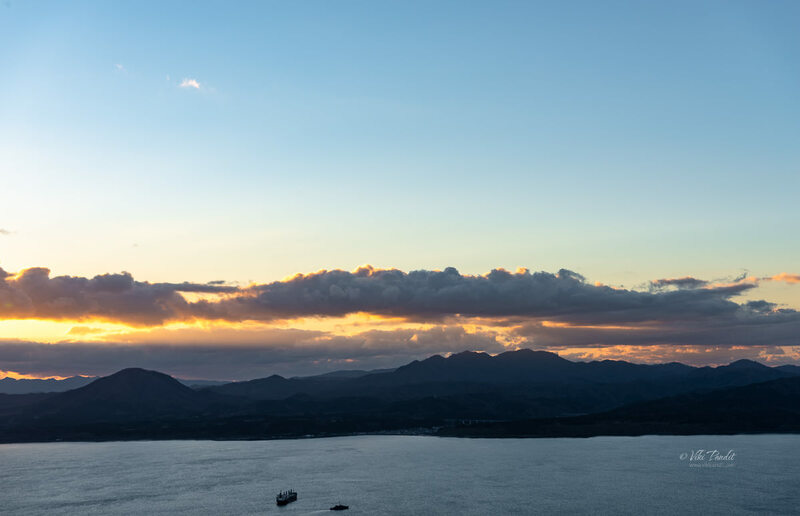 You can see the peak surrounded by Hakodate bay on three sides. A pleasant soft wind was blowing across the mountain. We took the stairs to the observation deck. The area was just starting to fill up. 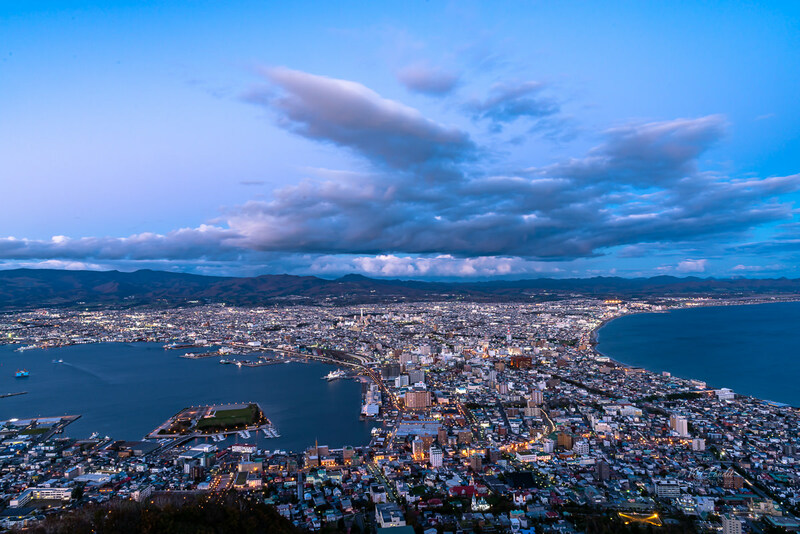 There are two observation decks at Mount Hakodate – one indoor and one outdoor. 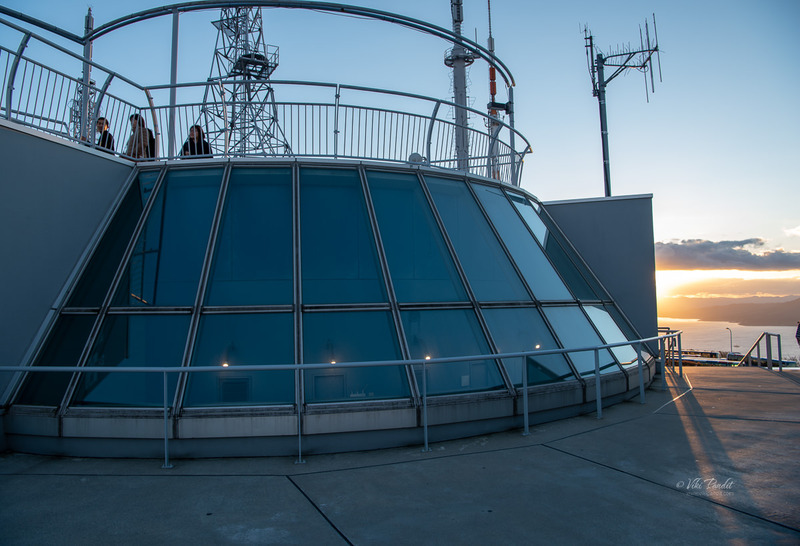 During the warm season from May to September, both outdoor and indoor observation decks get busy with many visitors. On the other hand, the outdoor deck is less crowded during the winter months of October to April, so you can cozy up and enjoy the night view in peace. Before setting up my tripod for the city view, I went across the platform capturing the beautiful sun setting behind the mountains. However it was not peaceful that evening. In about half an hour the place was teeming with people. It was a largely Chinese assimilation, but I was also able to make out some Thai and Europeans in the crowd. I had already set up my tripod before this loud crowd was set upon us to destroy a perfectly romantic evening. Yes the most Chinese are loud, almost like most Indians, wherever they go, they just cannot understand the meaning of enjoying something in “Silence”. Silence gives a feeling of spirituality when I see something breathtaking. The mind tends to wander aimlessly and all the material things in life seems so meaningless in that moment. I have felt it in many places – on the rocks of Engetsu, on the cliffs of Tojimbo and along the corridors of Todai-ji, to name a few. Totally different surroundings and yet filled by silence. I waited for the evening to show its colors. The gasps were there as were the jeers. School kids were there as well as the couples from far off lands. As darkness grew, the lights were beginning to come on. And it was a scene to behold. There I was standing over the city, looking at it as if it were an object, suddenly becoming alive. The night was upon us and we had a long way to go to Aomori. So I packed my equipment and left for the bus. Down at the bus stop, people were still coming in droves to witness the night view of the city. There was a long queue for the bus going back totthe city. We had to wait for around 20 minutes before we were able to get on the bus. The queues were long but the buses came at fairly regular intervals. The night view from Mt. 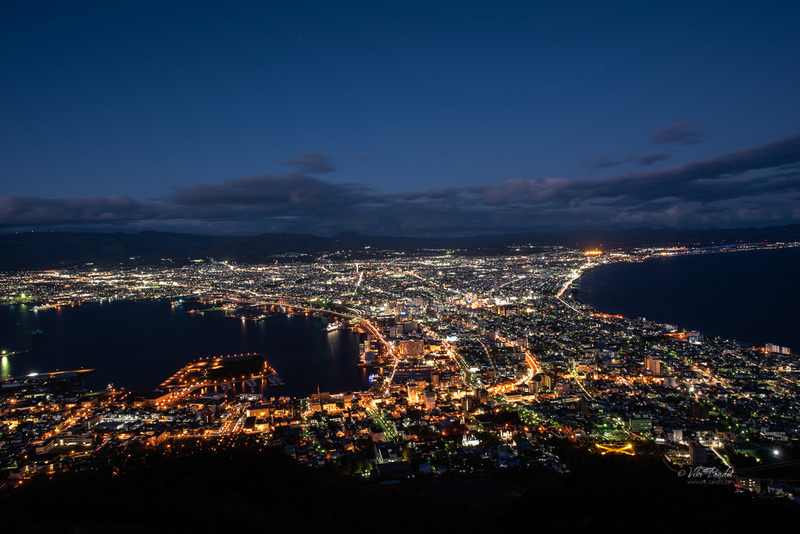 Hakodate looks like a sparkling jewelry box. 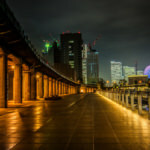 I have experienced some lovely night view in Japan like Aomori, and Tokyo and it surely is one of the best. Thanks for reading. 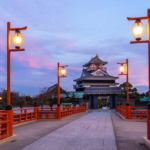 Please leave me a comment if you liked the post or follow my story as I visit the ruins of Utsunomiya Castle.